The Pines to Peaks to Pila course starts with our weekend in the UK to see you progress your riding from the forest to tackling some of the most beautiful and adrenaline filled riding in the UK. You’re a confident rider but the thought of venturing into the rocky and technically demanding Peaks isn’t something you are sure you can handle YET. This two-day course packs all of the teaching of our skills syllabus into an experience you will want to repeat again and again. Day one sees us meet at Sherwood Pines and puts your riding on track for a day in the hills on day two. Our second day sees us meet in the High Peak for a coffee and a warm by the fire of our favourite café before we head to one of many routes we will tailor to the group and the prevailing weather (local expertise counts for a lot). We progress into the hills where as we journey our team will coach “on location” some of the specific skills needed for tackling this beautiful terrain. We might spend some time sessioning classic descents amidst the backdrop of the stunning pine clad hillsides or tackling the single-track flow fests that lie all around us. The final stage of the course sees us pushing you to the limits, up in the high altitude mountains of Italy’s Aosta Valley and the resort of Pila. With descents starting at almost 3,000m above sea level and downhill trails that take over an hour to complete, this final stage is the ultimate test to put all your skills into practice. 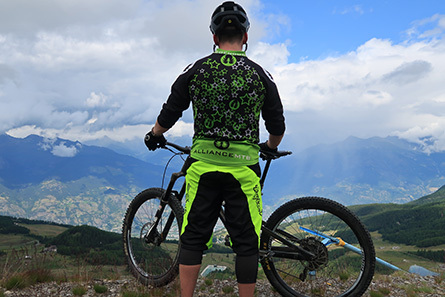 The course includes a full 3 days in Italy, complete with lift pass covering you for both Pila and nearby La Thuile, which often hosts a stage of the Enduro World Series. You’ll still be under the watchful eye of our coaches as they help you implement all you’ve learned during the day, and discuss the events over a beer or two in the evening! We take these rides seriously with hours of riding and guiding experience under our belts. So there are no excuses, make the move from Pines to Peaks to Pila with Alpine Revolution and Alliance MTB. What's included in the coaching package? The 3* Hotel Roma, run by the ever-popular Graziella, is always the first hotel to sell out! Graziella just loves everyone and the reception you'll get will mirror that! The 3* superior HB Aosta boasts an array of swanky, modern, stylish rooms all with minibar, safe and satellite TV. North facing rooms offer views over the Gran San Bernardo valley, while south facing rooms provide views over the old town and a wonderful Pila panorama. The Norden Palace is situated in one of the best locations in Aosta. The town centre, with its many attractions, is only a short 5/10 minute walk away and it is only a short walk from the Pila gondola. The 4* Hotel Cheval Blanc is a modern, elegant hotel with all the charm and comfort you would expect of a 4* hotel. It is situated on the edge of Aosta, although still within walking distance of the centre. Step through the front door and you'll be charmed by retro Italian style, reminiscent of the mid 1900s, whilst the bedrooms are elegant and sophisticated. Don't want to bring your own bike? You'll have the option of hiring one in the Aosta Valley. We know it can be time consuming and stressful booking flights, that's why we offer the service of doing it for you! Complete the enquiry form, drop us an email to gobiking@alpinrevolution.co.uk or call our friendly team on 01623 272711 to register your interest. A deposit of £75pp is required to confirm the booking, which will be taken when we get in contact you or over the phone. Please find the form below.